Seeing the Sky service down on your Now TV isn’t fun, especially when you get problems during a vital moment like during 2014 Premier League Title. This was one moment many customers would never forget, although the company did offer refunds to those with issues. It fair to say, we haven’t seen Now TV receive a lot of issues over the time it’s been online but if you have then we’d love to hear about it below. The most common issue with Now TV is video streaming and this could be on a number of devices considering you can watch on a set-top-box, mobile, computer, and other devices. If you’ve had problems today or recently, then leave a report below or use the support contact information on this page. If Now TV is down today, then reports will be found below. For the last couple of days I keep getting the message that sign in is not available and to try again later. Seems impossible to get in touch with now tv too! The only problem I have is watching live entertainment channels, in particular the Gold channel. It jumps and then freezes and makes a buzzing noise during the few seconds. There are also static lines across the screen during the freezing. This does not happen on any other live streaming channel, just Gold. We thought maybe it was the tv but seeing as it’s just this one channel, we have isolated the problem to the internet which is also Now TV or the Roku stick. Any ideas how to fix? Just started watching Recently added movie on now Tv and 15 minutes into it the playback changes completely to that of a very poor quality copy….the same thing happened last week with a different film ? My Facebook app has gone and its not showing up anymore. My Photos on my Facebook were being used as a screensaver on my NOW TV. What?????? Should I change to full BT TV? Now TV is very good indeed when its working, lately it has not been working when trying to choose a movie. It is immensely irritating to take out a day pass in order to watch a sporting event on Sky Sports on my PC (Win 10). Doesn’t work in Edge or Chrome, needs silverlight installed, eventually works on Firefox but you can’t just: go to an event on Sky Sports, click get a day pass, and watch just like that. At least, I can’t. Each time I try it, I have to go through several screens to get then activate a pass and then to get the blasted thing to load and stream can take several frustrated click cycles. for these reasons I now rarely try it at all, and will wait until it works properly, conveniently, and universally – it that ever happens. New users, be warned. Error code is something to do with sign up, but if you are already signed up, which I guess you are Jessica I have no clue as to why you are getting this code number. 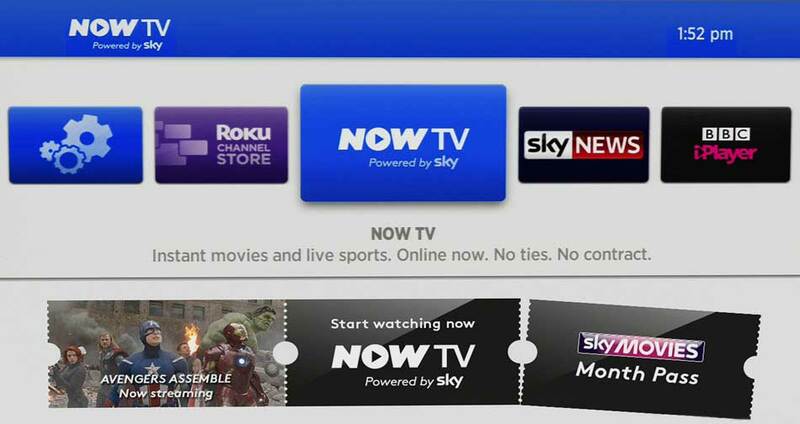 I have been trying to watch stuff via my Sky Now TV box and nothing will play. I am getting error code 1014, what does this mean? Won’t let me go into any shows,lists them but jumps straight back to homescreen when try to play anything. Streaming or box sets!! No problem with wifi and was working fine last night. My nowtv box is saying sorry the region you’re trying to watch in is not supported. Now tv is only available within the uk. Error 1301. Content geo blocked. I am in England . I live in Essex 5 minutes from London!!!!!!!!!! Have had five days of it crashing. Cannot get anything on SS this afternoon. Essex v Yorkshire won’t stream. It is a hopeless service . I wish I hadn’t signed up for a year. I am going to be paying Â£300 for a very poor product. I cannot get anything to play, no matter what I choose. Even when I did get a show to play it was painstakingly slow. When opening it just shows a blank screen, so for me Sky Now TV is down and out. Any reason why? Mine has just gone off when trying to log in failed on website when trying to find out what the problem is only that there is maintenance being carried out, you should get a notification telling you before if this is the case as you are paying a subscription fee. Now tv is currently down!! 🙁 wanted to watch the god father part 2. Is now tv down??? Haven’t manage to get a programme to play since 8! Here we go again, you’d have thought we would have learnt by now to avoid this rip off service ! Just paid to watch today’s West Ham vs C Palace , funnily enough the payment went through without a hitch ! But nothing happening and missing the match we’ve paid for! SHAME ON YOU lot responsible for this total shambles ! Disgusting , if you cared at all you’d have sorted these issues out a long time ago. Can’t seem to get any now tv working in Apple tv and sky news also not working on same? Is now TV down again today , as keep getting message. Sorry something went wrong , we’re working on it. Becoming a pain in the arse especially over Christmas. What’s going on with Sky today, I’m I the only one it’s down for in Maidstone, Kent? It looks like Now tv is not working again …says cannot access this service. My Now TV live stream isn’t working, I can get it to work on ipad. I keep getting the message Max Number on my account and I must stop playback.